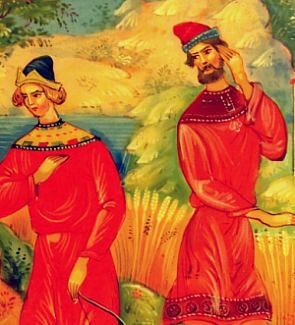 Prince Ivan's face betrays disgust when he first sees his new bride: a frog. His brothers stand beside him, looking as if they are reasoning with him to abandon the idea. The frog, painted in the left corner, is handing Ivan back his arrow. Trees, wheat bushes, shrubs, hills, and a lake form the country side background of the painting. The colors of this lovely traditional Mstera box are very eye-pleasing. The box is made from papier mache. It sits flat (no legs), and opens without a hinge. The interior is red. Signed with the artist's initials, name of the work, and village. "Handpainted in USSR" is written on the bottom of the box. The lacquer on the box is grainy from age, though one might say it gives it more character.